The rest of my family arrived on a Friday night, excited and ready for a full week of exploring on the island. Mom, Gina, and I planned to meet them to show them back to my house, and since we were in the Aiea area I decided to throw in a short hike to make the most of the drive. 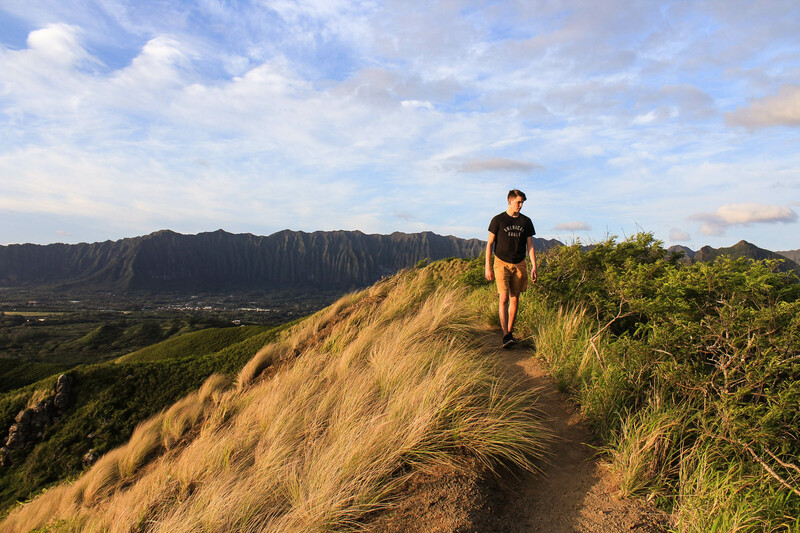 We did the beginning of the hike around Aiea Loop Trail, one of the first hikes Curtis and I did last fall. Since we had limited time, we started at the higher parking lot and went a little under halfway around, until we reached the best lookout on the trail. It was a bit longer than I remembered, and I didn’t remember that it had such a consistent uphill slope, but it was still gradual enough to not make it too challenging. After the hike, we met up with the rest of our family and returned home. Sadly my brother living in Oregon couldn’t join us, so it wasn’t quite a full family reunion — maybe next time! 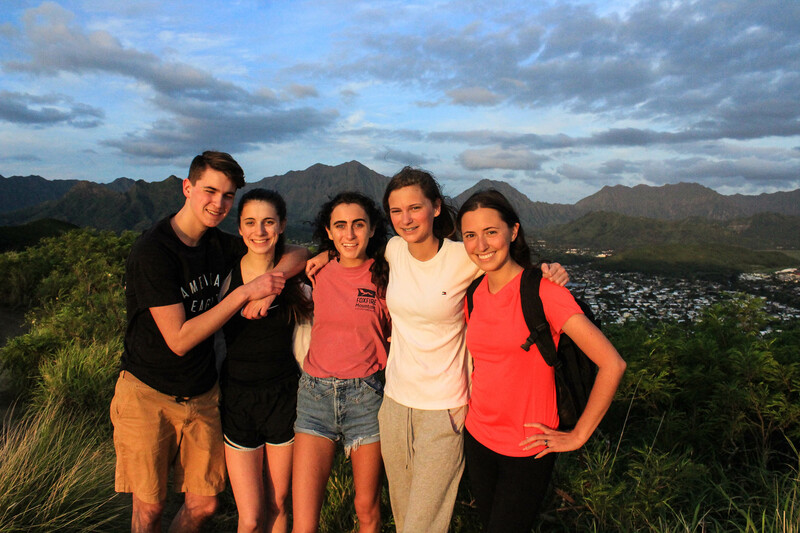 Their first full day here started off bright and early for a sunrise hike up Ka’iwa Ridge. I was shocked that it was actually the least busy I’ve seen that hike, on a weekend at sunrise no less! We also ended up hiking further along the ridge than I have before. The views don’t change much after the second bunker, but it’s much easier to enjoy when there aren’t other hikers everywhere you turn! This was my 4th time hiking it in just over the span of one month — the trail actually just closed for maintenance for a few months and I’m a little sad to not be able to use it as my easy sunrise go-to. The maintenance is overdue though, as this trail is being “loved to death”! I’m just glad it was open for when my family was here. Everyone loved the hike and the views, and it was the perfect way to start off our week. After the hike, we went to wade in the ocean at Kailua Beach, then returned home for some breakfast. The weather was absolutely perfect that day, so we didn’t stay home for long — we packed up some snacks, towels, and our new boogie boards and headed back to the beach! Wanting to switch things up a bit, I decided to try out Bellows Beach, the Air Force beach on the Windward coast. Curtis and I had checked it out briefly one day and I thought it was worth a shot. It’s only open to the public on weekends and holidays, and seemed to be less busy than other Windward beaches. 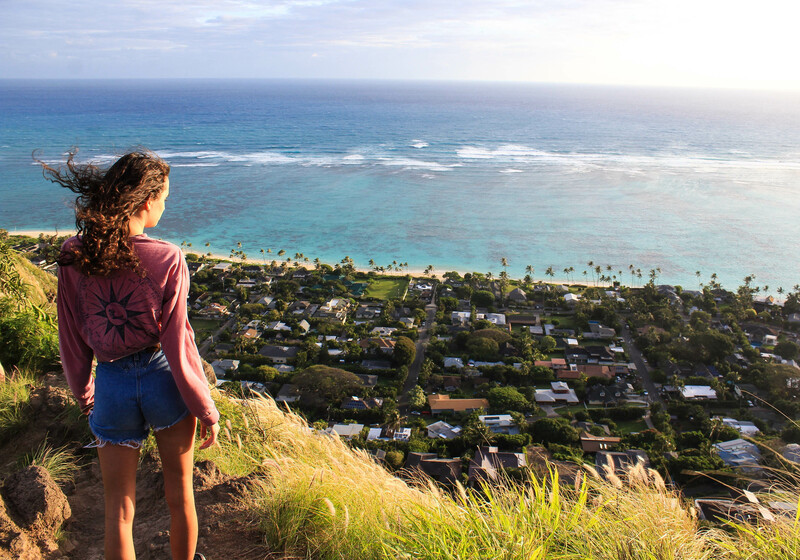 It turned out to be the best decision for a weekend beach trip — it wasn’t crowded at all, and the views stretched from the Southern Lanikai foothills all the way to Makapu’u lighthouse. We could even make out Molokai, the next island to the East, in the distance! The waves were also bigger and more exciting than Kailua Bay. The one unfortunate thing I noticed was that there was a lot more trash and plastic waste on this beach, and it only got worse as we walked South to Waimanelo Beach. The next day, we decided to drive up to the North shore in search of sea turtles and more hiking. I have yet to see one here — I honestly haven’t gone to any beaches where they’re more common though. I searched different Facebook groups and articles looking for the best place, and ended up deciding to hike to Kahuku Point, the Northernmost point of Oahu. We began our walk near the Turtle Bay resort — sounds promising, right? Unfortunately no turtles were seen on our hike today, it looks like I’ll have to try harder and bring them back another time to find the Hawaiian sea turtles. The hike itself simply followed the coast, but it was much harder than it seemed. I don’t know how to describe the sand, it was just deep and hard to walk through. 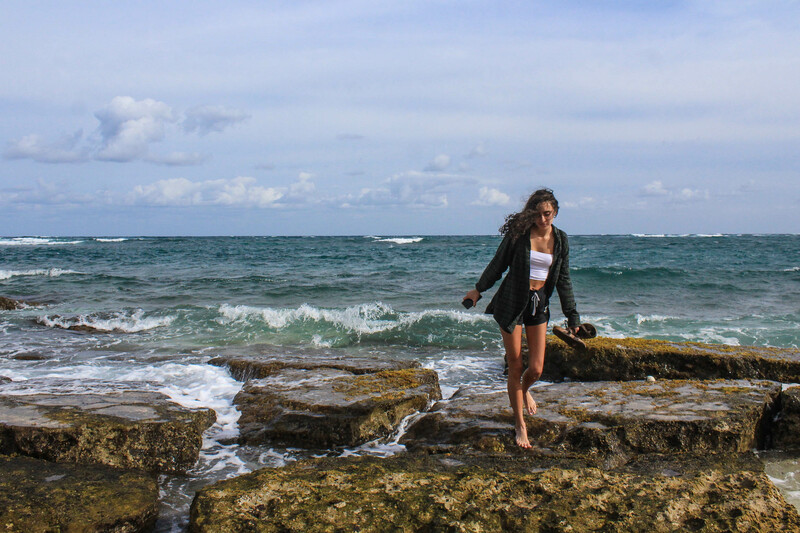 The other option was to walk along the exposed coral, which was fun for searching for sea creatures, but required more attentive walking. As we approached the Northernmost point, we were soon walking only on coral, and it became more sharp and narrow. Only a few brave souls reached the actual point, and I’ll admit I wasn’t one of them. Most of us were wearing flip flops, which is ideal for sand walking but not on the coral. I’ll be better prepared whenever Curtis wants to join me for this walk! 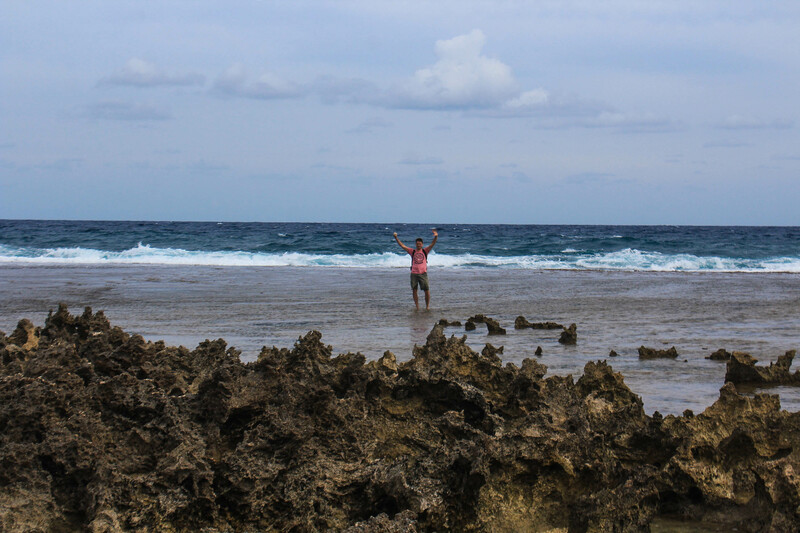 While we saw no turtles, whales, or monk seals, we did spot some fish and crabs, as well as cool coral rocks. We found an easier paved trail for our return trip that lead us around the national wildlife refuge, a golf course, and back to the resort and our car.